Your opinion matters, especially when you are sharing your Pacific Tax experience with a friend or family member. Now there’s another great reason to tell someone why you’re with Pacific Tax—for every person you refer and meets with one of our tax specialists, we’ll give them a $30 price reduction. With the growing number of people trying to refinance and navigate the volatile world of real estate, we are here to offer a one-time discount for new clients. As a home owner, Pacific Tax understands that you need to be able to maximize your tax options while also being given superior tax services. We will even give you a special $30 off of our regular rate just for trying us. Pass this coupon on to a friend or neighbor and ask us about our referral program! Click here to obtain the coupon. Did you buy a new home this year? 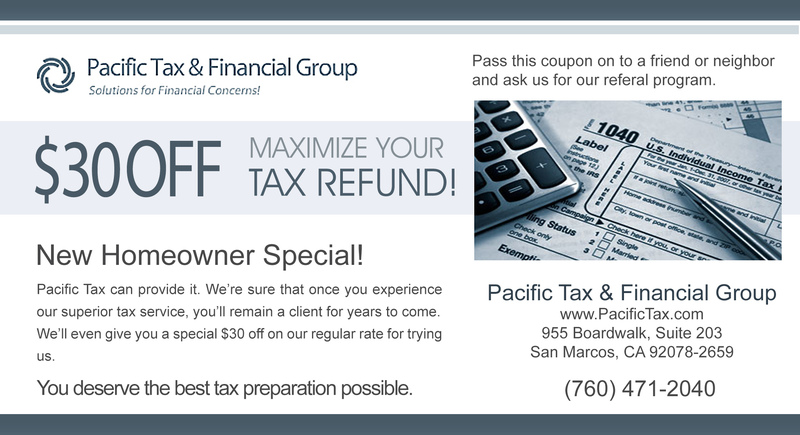 We’d love for you to come in for a free consultation so we can help you analyze the tax impacts of your new home. If you choose to do your taxes with us after your consultation, we’ll give you a one time $30 discount off this years fee!